Trae, Carter and others are no longer probable. They are off of the injury report. Stay healthy Lin. Little by little. Go Lin! Play smart and stay healthy! Let’s go JLin! Look for your own shots and be safe! Also FREE NBA League Pass. Just don’t see the Hawks playing hard or giving extra effort on defense. Can’t box out and rebound for beans right now. 2 poor shots by trae. love shredding the d with easy layups. timeout and will see Lin. JLin in. Right away, turnover by Prince? Baze? Oh jeeeeezzzz! Can’t even secure a rebound. Bembry on push shot? Is that in his toolbox? Okay, found Spellman for 3! Lin too strong off glass. Drew a foul on next drive. Lin out in 2 mins? BAHAHA HE PLAYED 2 MIN! He’s putting his jersey on already. Yes. Still not taking open midrange shots for some reason. Out too soon. Clarkson with 2 nice 3s. Instant offense. Not competitive. Not really fun to watch. Clearly Caves is a much much better team. BS cp3 suspended only 2 games but rondo for 3 games. First time watching hawks, wow, bad team. I don’t know how long I can continue to watch the hawks. Clearly they are looking at Lin like a 3rd string / G-league PG. The rookies are getting time. Huerter and Spellman both in EARLY with Young. If even that. 2 mins? I know. LP has been insulting Lin ever since season has started. If you have time, I posted something about CP3 in the previous thread. It’s as close to “corruption” as it gets. All this team needs is time, patience, experience, practice…and a new roster. Including coaches, you meant? LOL. Well, even without LeBron, the Cavs are still a veteran team, with playoff experience, in the NBA finals last year. Even then, they’re 0-2 so far. Just tuned in. Lin only played 2 min. in 1st quarter. He’s fine, actually looking better. No, don’t think so. He seemed okay. HE’S BACK IN NOW. Not injured, moving better than last game. But still hesitant to shoot, drives into traffic. Clarkson still hitting. Trae shooting better. Everyone can made bad decision without consequences except Lin. Only played Lin for 2 minutes, maybe just let Young have time to drink. Lin with Trae and the starters now. Maybe the 2 mins was just to get him loose and warmed up. Lin looks stronger, D looks more on point. He needs to take jump shots, IMO. Lin in at 8:48 in Q2. Hope it’s more than 2 mins this time. i predict 10 min for lin tonight! Small ball experiment? Baze at 3 and Prince at 4. Small ball not working so far on D, Osman has size on Lin. Not fair. Lin got tripped up again. Ugh. Just glad at worst, bumps and bruises. But no ball movement. No weak side action. Just one-on-one. Not good recipe. Uh oh. Lin turnover. Speed still not there. He normally would have blown by the defenders. He really needs to demand himself into the offense. Trae looks impressive. No doubt about it. Now Lin seems only be used on D.
Watching Young tbh the guy can stroke it. Lin’s defense helps! He also diverted some defense attention from the Cavs. on his teammates. He played 5 min. with only 1 FGA! I have only watched about 2 and 1/2 of the hawks games and I can’t believe how much I hates them already. Please trade Lin…. He is not good enough to demand himself into the offense..if he was he would have shown it. 2 years of injuries took away a lot of what made him dangerous. The Hawks can score. But they give up just as much. Giving up 56 with 3 mins to go. Yikes! Then go to a Young forum. Post there. Lots of Hawks forums out there. I’m sure they would love to have you. Lin at this point of his career is a veteran PG and getting the offense going for 2nd unit. After 2 big injuries and at the age of 30, it’s hard to be a starter again. Lin had good 6 years in the NBA as a starter/6th man. He made a difference and was relevant. First asian to ever do so since the great Yao Ming. I’m happy with it and would rather enjoy it whenever he plays and see him help the team win in anyway possible. Hopefully he joins a contender as the backup PG next year much like Shaun Livingston with the warriors. Len! Playing like the big 7’2 man! I know. Love that Linsanity highlight video that you always post. After 8 years, a few more months won’t hurt…hang in there. Honestly, I think Lin was effective on the defensive end. I don’t like what I’m seeing from him offensively, but he’s rehabbing. Considering the bad start, the 3 pointers are keeping them in it. And foul calls (FTs). But still gotta rebound and get stops. How many people here honestly think Lin is going to be the same? He’s been on like 20 different teams. He should have stayed in charlotte he would have been a great fit there. Instead he went to the nets and barely played only to when have came back go to the hawks. Did you read Lin’s interview in the last thread? What Lin said about how fans think they know better? He was talking to guys like you. Lin was awesome on the Nets when he was healthy. He acted like the leader and captain of the team. It was the right thing to do. So glad to see a reasonable voice on this board. Thanks Alain. ah yes of course. Lin has shown us he knows exactly what he is doing. TY with 21 pts in 1H. 64-60 Hawks. He’s going to hit 30 points soon in a game. He can score and really, he has handles as well and decent court vision. He’s not impressive on the defensive end. So, no one is forcing you to follow him. You don’t like him, too bad. Go elsewhere. Stop projecting expectations. Stop living your life through him. He did good until he got injured 2 years in a row. That ended his career pretty much. He was a solid starter/good 6th man. His play style was never gonna make a superstar. It was a good career. He still couldve got injured at Charlotte and ended up the same. no it wasnt he commited to years of mediocrity just to help the young ones in the future. He commited to not playing in the playoffs for years. Had he stayed in charlotte they would have played in the playoffs. That was a fun team to watch with him and kemba. Lin is not Lebron He cant take a group of unproven players to the promised land. He could have been playing great right now with charlotte. He’s a scorer and playing with a lot of confidence. No one on hawks are impressing on the defensive end. Hope there’s lots there left! Dude your name is Linintheszone who is living their life through who? im calling it they way it is your the one not seeing it. Hopefully, the coach intends to preserve Lin for the sake of his health. It was because it was the starting PG job he wanted, he played with a dominant center, and he played for a coach who knew and liked his game. He had yo yo minutes for Charlotte. And that team prioritized Batum and lost a lot of their free agents. I wouldn’t call Brook Lopez dominant though. That team was pretty bad but they turned it around now. His career is not over. He’s playing now and trying to work back physically and mentally into playing in the NBA again. And he’s on a team he did not expect to be on. Did presence of (still hobbled? : ) JLin open up the court for Trae Young in Q2 vs. Cavs? With the right guys around him, he was on offense. If not dominant, then excellent. ah so it’s all about the money for Lin. Then of course not he made the right choice it’s easy money. I did recall Lin saying he wanted to win a championship. And also how many endorsments doesnt that guy have. Any player can get injured at any time. Lin was trying to live out his dream. Why not? Why shouldn’t he strive for it? No risk, no reward. He had the chance to take the risk. Injury detour. Let’s see how much further this goes. I keep saying, Lin hasn’t give up. So, as fans, I’d like to think we shouldn’t give up on him either. Young is a baller he can create for himself. Give up what? he’s still playing just different role. But serious question, what happened to DrewBear1? First time i’ve heard the word dominant along with Lopez. I’m not disagreeing it’s not the same as before. He’s post-injury, young PGs are emerging all over the league, and Lin may have to go to a role that’s different. I still think starting 2 (cofacilitator) or 6th man is possible on a contender. Lopez evolved. Brook-Lin was pretty good together. They won a lot more when Lin wasn’t hurt. He wont be starting at the 2. I he is lucky he can get a Rose type role. But Rose looks real good when he plays. As long as he didn’t eat him. My Goodness! How can a Lin “fan” blame Lin for things out of his control? Lin can not control being traded from Brooklyn to Atlanta. Lin can not control Nets GM signing a PG from Lakers. Lin can not control the PT assigned by the coach. Stop blaming Lin for circumstances totally out of his control! What an arrogant “fan” you are! You think you know better than Lin who manages to stay in NBA despite adverse circumstances for 8 years! Those made-3 pointers were good. Opened up the court. That was good floor spacing. Gave Young room to work. That’s the way it should be. No Bembry clogging the lane. I blame HIM for choosing to play on the WORST team in the eastern conference basically dooming him to years of mediocrity because he wanted a starting job. Instead of playing with a playoff potential team. yeah i blame him for that he had control of that. I did not need to use the Block feature till today! really thats all you got? Yup you motheeer [email protected]@Ker, thats good enough to a piece of SHHHHIt like you! The Hawks are winning this game. Not true. Even among guards. Lowry, Dragic, Collison, Conley, Teague, George Hill, Beverley (LOL), and even Curry (not comparing Lin to Curry, just age). But glad you are still enjoying it. Hope there will be upturn soon. 30 points for Trae with lots more time to go in this game. Lin’s recovering now. Honestly, I expected big ups and downs. We didn’t get to the ups yet. Hopefully, if he doesn’t get reinjured, we will in time. Give me his averages predict them. lets see how upppp his ups will be. Lin in 4:11 in Q3, actually took a 3 but was short. Bad layup. I wasn’t focusing on the word “dominant”. Agree Brook wasn’t the best rebounder and wasn’t going to build around Lopez. Marks wanted to offload Brook’s contract and get a former #2 pick. LOL. Great minds think alike. I just blocked someone also, for the first time. Lin has a chance now to keep the lead. He’s looking ok. He was fouled on the drive. It’s almost like he’s got rookie nerves. At first, I thought it was good discussion. Nope. Will stop now. Lin taking some bad shots right now. Right idea there with Lin. Looks to have more life, now. Yikes, Lin’s shot just isn’t there. Missing open 3s, midrange, and even airballing layups. Not a good game for Lin so far. I don’t think so. I THINK it’s because they finally got some 3 pointers to go in. Lin short on mid range pull-up. Out with 38 sec remaining in Q3. I’m not looking if the shots fall. I’m looking for Lin’s involvement, energy, engagement, and he finally looks like he woke up and put in the effort. Shots will fall at some point. But he took a better variety of shots and looked to get the ball back more. Yeah Lin’s looking shaky. TY is looking good. Without jump shot, Lin only can drive to the rim. But it seems everyone knows that. Lin need to be able to shoot at a standstill position. No need to jump all the time. Trae Young on a roll! That’s some green light – 21 shots, most on the team. But he’s hot, and making them, so can’t knock it. More like Lin not trusting his shot and driving and hoping to pass or get to the FT line. yup did not think he was that good at shooting tho…boy was i wrong. 3 min. PT in 3Q. This game Lin saw the court 3 min. each for 3 quarters. It’s definitely mental, but it’s more that he doesn’t trust himself. Baze is now the PG. Lin’s not even a backup PG. Timeout Cavs with 17 pt deficit. 108-91 with 7:55 remaining. Not sure about the speed. On the fast break, he didn’t beat the defenders down court, at least not on that one play…. Lin is done today, 10 min 0 point. Cavs are serious trash without LeBron. Wow. Very surprise they’re this bad. Yeah because Cavs have no perimeter defense. How does one get into offensive rythm when one plays only 3 min. each quarter? He has some speed but not Lin speed or acceleration. The Hawks are in an offensive rhythm now. I give the credit to Young and Baze making their 3’s. And to Huerter with his rebounding. And of course, no foul call. Yeah, even Spellman and Bembry made their 3’s! They were terrible the last 2 games. No Lin with 3:25 remaining in game. 1:53 remaining, any Lin sighting? Yeah, I started off saying how they’ve still got a bunch of vets who’ve been to playoffs with other teams, and the Love with being in the finals. From 17 min last game to 9 min tonight – this is not how he found his rhythm or confidence returning to game after long absence. no he is done. other players shooting well and he wasnt. Also don’t think Ty Lue is such a good coach. Talk about riding LeBron’s coattails. I don’t think coach dislikes Lin at all. Lin is a player coming back from a major injury. And it shows. No, at this point. Why risk injury. The good news is. For those who wanted Lin off a tanking team. Doesn’t look like they’re tanking tonight. Lin played bad game today, won’t even get any garbage time. Pierce just emptied the bench and Lin’s still on it. Have to agree. Lin did not play well tonight. But, it is what it is. 79 more games to go. I agree. Heck Korver didn’t even get off the bench. Young played about 40 minutes. 1 trea is an elite shooter. 2 Lin physically looked a bit better but has to work on his rhythm. Well, I hope Lin gets into a better mindset and finds his shot for the home opener on Wednesday. It’s the only nationally-broadcasted game for the Hawks this year. Tonight was just a nightmare for Lin. I have a bad feeling about Lin’s PT. He played 17 min last game and 9 min tonight. Is it going to be 1 min next? Does it reflect that the coach has no trust in Lin? Also, how can any player, Lin included, get into any rhythm with 3 min of PT each quarter? no it wasnt. he is coming back from a major injury. normal rules dont apply. I still want my highlights I don’t care….. 10mins?? Glad I didn’t waste my time. . What happened? Only for Lin fans, not an excuse for anyone else. trade is the best scenario for him. You can’t blame everything on the coach. Lin played awful this game. Then again, Lin is a rhythm player. He can’t get into rhythm if he’s not being given minutes to play. Tonight, he did not deserve the minutes, but he can’t get out of his funk either if he’s being playing. Lin is stuck in a conundrum right now. Pierce and the Hawks don’t give a crap if Lin’s a rhythm player or not. If he’s not producing, he won’t be playing. Can or would they still send Lin to the D-league? actually 9 min per nba.com. He played 3 min each of the first 3 quarters. Totally agree. Lin is coming back from a devastating injury. I’m happy with his 3rd stint tonight. If he takes that approach, the shots will fall for him in coming games. Agreed, Lin has played 8 years NBA. Why give him more time than rookies if he played like today. The Hawks won because they were shooting 47% from 3. Looks like Pierce were playing the hot hands. And the rookies got time because they were playing well. Baze got more time than Prince (who was not shooting well). Huerter 25 mins. Spellman 23 mins. Poythress 23 mins. Prince only 25. Bembry only 15. Carter only 12.
when his is healthy, he will out play all those players getting minutes infront of him. thats why im calm. atleast my second favourite player is doing well! on another note i wish Lin the best. I hope he gets a team that aint tanking and gets to play atleast 20 min a game. Yeah, it’s tough. Rock and a hard place. I do wonder what’s going on behind the scenes. How is Lin playing in scrimmages in practice. Good. Lin played better when the team was competitive and Lin’s D is what help them get on a run. No apparent injuries and he gets a few games off before the home game on Wednesday. Good point. Maybe a lot of his PT is based on that. We don’t see or know everything by just watching the game. That’s why I want to see Pierce’s comments on Lin. Hey, just noticed that….Cavs tanking? Lin most likely doesn’t impress during practice because he doesn’t want to get injured, especially during practice. Lin can’t play his game because his #1 goal this season is to not get injured. The problem is, Lin’s game is him going all-out and being confident. He can’t be confident and can’t go all-out because he wants to stay healthy. Lin has to figure out how to get his game back while also protecting his body from injuries. He can no longer be reckless, driving to the rim all game. Lin’s shot has to come back or he’ll be out of the league. That’s really what it all boils down to. He has to be a threat to drain 3s and midrange jumpers every single game. I know. Sigh. If Lin can do something about it right now, I would be more upset. But he is kinda stuck at the moment. And we don’t know what the organization wants to do. We hear they want to win. But there’s still the temptation of tanking for high pick. My only fear is that they will waive Lin. That’s why I don’t want to complain too much about all this. As long as they are still keeping Lin and letting him recover as an active player on the team. I would not say Lin played better tonight. The 20 point preseason game is the model Lin can use. Of course, that was a preseason game. But that approach, at regular game speed and intensity, will yield Lin a lot of points later in the season. Make a few of the 2s, 3s, and he’ll get 30 points instead of 20. But that’s in time. He’s trying to ramp up to that and it’ll take time. How much? I have no idea. Don’t look at points. Look at his approach, involvement, intensity, strength, etc. Lin didn’t get pushed around that much in this game, played better D. It started with his D even though his O wasn’t there. And in the last stint, Lin was more aggressively positioning himself to get the ball and make plays. Sometimes the ball falls in the rim, sometimes not. But that approach of mixing in drives and trying to finish with jumpers, a few jumpers and a few drives, and dishing off the drives, will work for Lin when he gets his rhythm. All drives, like he did in previous games, will not. Too 1-dimensional. I hate being a pessimist. I try to avoid that. But I’m not sure about Wednesday. Vs Doncic. If Young continues to play well, he will get lots of minutes. For Schlenk to look good. Happy is too strong. LOL. But glad no injury! (that we know of). Great point! I agree fully with you. I was going to purchase LP, now I wonder if I should. It is $200 after all. I’m actually happy about it. The streams work fine. League pass isn’t worth it. LP for just one team is slightly cheaper, at $120. What if he switches teams mid season? As much as I love Lin, for him to stay (and thrive) in NBA (which I wish as long as Vince Carter or Kobe Bryan), I would not call shooting 0 of 4, 0 assists and 1 TOV “better” than his last game. I think you can switch teams. Not sure. You’re looking at numbers. I’m looking at other things on the court. He was stronger. I just want to see a bit more strength every game and I saw that. I disagree with your assessment. However, to each his own. Did you think he looked physically weaker? I know he didn’t shoot the ball well, but how did he look physically to you? Agree that Lin needs to shoot and make his jumpshots. If the shots are open, just treat it like practice. Driving and hoping to get foul calls may increase his risk of re-injury. But then, what do I know. I just don’t know if maybe he’s not physically back yet. If not, then not much he can do about it. It’s a miracle that he’s even running and dribbling a basketball on an NBA team, in an NBA game. I kind of thinking that JLin’s primary agenda this game wasn’t to continuing padding his individual stats, but rather showcase to other teams that 1) his world class acceleration from a standstill is coming back, and 2) that knee can take contact attacking the rim. That’s it. I’m not expecting Lin to be himself for a long time. Just small improvements. I think the preseason games gave a sort of false indication of his readiness for the real season. Basketball is all about rhythm. If you don’t touch the ball that much it’s hard to get into a good rhythm. Knowing Jeremy’s game he needs to make some free throw first during the game and when he does he usually can make baskets after that. if you are in and out of the game every 2 mins there’s no way you’ll get into a good rhythm. If this was with nets he’ll be allowed to play through and eventually score. I would let him a whole quarter and sit him the next three. Yes, true. Lin can play off-ball, but he’s at his best with the ball in his hands, initiating plays. Not sure about free throws though. Because that means relying on Refs to make the calls when he’s driving to the rim. Risky. IF HE CAN, I think it would be less risky to take and make some open jump shots. he needs to see the ball go in….it’s mental at this point because he knows his coach will pull him out with little mistake. I mean, even IF, big IF, the Hawks are treating him as 3rd string now. Not even 3rd string players get pulled after 2 or 3 minutes in the middle of the game. Unless they are costing a win for the team. So, I’m not sure what that was all about. There may not be any Lin highlights tonight, unless on the defensive end. You want TEAM highlights? Probably going to be mostly about TYoung. He’s had big games on and off-ball. He tends to like to play with 2 PGs. I think, if Lin’s aggressive, he rocks. If not, even if he has the ball in his hands at first to bring it up the court, if he’s not in aggressive mode, he ends up in the corner and not getting it back a lot. Really really really really – REALLY hope that the Hawks will treat him well, and give Lin the time and patience to do that……. Lin is untradable at the moment. he will likely be waived after the trade deadline. He plays off-ball, and has learned to be good at it, because that’s what has been allowing him to continue to play in this league. He had to adjust his game because of Harden, and Walker. He wasn’t going to win those battles. How long have you been watching Lin? You realize that this is his 3rd regular season game back after one of the worst injuriees you can get in the sport? You also realize that Lin throughout his career has looked like barely an NBA player at times to suddenly having a game where he looks like an all-star, right? He wont get waived, Plenty of teams can use him. He got traded to the worst team imaginable. But he seriously needs to reinvent himself. i give him 10 more games if it contiinues like this. you never know what might happen. Did you see Lin play with Barron Davis? Lin played off-ball since Woodson from my memories. And even in Harvard he played off-ball in some games. Lin really is a combo guard. i wonder what jeremy is going through right now…..he’s probably thinking how he can reverse this and start scoring with this impossible rotation. but Lin is more established now. if he’s unable to bring the same things to the table as pre-injured Lin, then playoff contending teams will not want him. let’s see where he’s at after 20 games. Considering what happened to Andre Roberson who had the same injury and recently re-injured maybe the team and Jlin is just playing it safe. Even if this low minutes continues for 15-20 games I think it is safer than to pile on minutes for stats or for fans like us. Maybe the one to worry about is young Trae Young. Lots of minutes, lots of fast, frantic activity. He is young so maybe he can take it but not for 82 games. It would be ironic if this high use rate for TY resulted in injury and Jlin had to play major minutes, which I don’t think is a good idea for the above stated medical reasons Whether ATL is tanking or not, Jlin has the luxury of time in coming back, assuming the whole hearted support of the ATL organization. It is still early. doesn’t matter how many games….he can’t show his talent on limited minutes. I would wait to buy LP since Lin is not playing much. Lin needs a bit longer stint. Maybe 2 stint of 6 minutes per half. Right now, he’s getting subbed too fast, after 3-4 minutes. Can’t get warmed up with that type of time. Tommy Ameker is black as is Paul Silas as an assistant. Both were supportive coaches. White and black coaches have mistreated coaches and even Asians haven’t supported Lin at times. Rich Cho said he didn’t trust Lin’s numbers because Lin was Asian. Cho is Asian. This isn’t a helpful comment. Lin value is as a trade asset, and his health is Atlanta sole concern. They want him healthy by the time Lin is eligible to be traded which is in November. That’s their goal for Lin and if it means not playing much to guaranty he’s healthy to be traded, that’s exactly what they’re do. I wouldn’t be surprised if the Hawks have an agreement with another NBA team. My preference would be the Orlando Magic who’s coached by Steve Clifford. They could use a PG and we all know how much Clifford loved Lin, but too much as a PG. But he has no Kemba Walker, so maybe Lin could start for them. Exactly. The limited minutes aren’t the problem. He just need longer stint on the court. I would be fine if Lin would get 16 minutes per game but play 7-8 straight minutes per half. The problem is the coach won’t let him play past 4-5 minutes per sub appearances. You need time to warm up and get into the flow of the game. when can jeremy be traded Feb? I agree with you. Scoring is how the uninitiated measure impact. I remember watching Yuta last year trying out for the Nets and his scoring wasn’t great but what I saw was his movement off ball and knowing where to be at all times. That’s why I was so impressed with Yuta. What all these rookies need is to be taught how to move in synch as one and not as individual iso parts. The success for the Hawks and Lin is not how he scores but how he can change the playing patterns of the youngsters. I believe that the GM paid Lin for his leadership and not for his scoring. Schlenk knows that without coach Lin organizing the kids, his drafts will continue to lose and make him look bad. The worst non black coach was Mchale. Let’s not bring race in to the conversations. What might be even more difficult than the physical recovery is the psychological one. Two years ago he was arguably at the peak of his career. He had a solid contract and was given the leadership role of a young team. Then the injuries. The first season with the Nets he remained part of the team despite being in rehab for more than half the season. He stayed connected with his teammates and was able to complete the season as a starter. The second season’s injury was heartbreaking and pretty much cut him off from the rest of the team. He wasn’t even in the same country for much of the year. That alone must have been a huge blow, but the sudden trade must have shattered his confidence in everything in his basketball world. I think it shattered confidence in himself. It looked like he was regaining that self confidence in the final two games of preseason. But then Pierce made a joking comment about Linsanity and I think that might’ve thrown Jeremy off before the first regular season game. I know that seems a small thing and it’s pure conjecture, but I don’t know what else might’ve caused him to play so tentatively these past 3 games. Preseason games are exhibition games with none of the intensity and purpose of regular season games. Lin needs time to ramp up. He physically looked stronger today and I think Atlanta is monitoring is health. An injured Lin does Atlanta no good and would be devastating for us Lin fans. How is Pat Beverley still starting PG? right after injury too? I don’t get it. Is it really basketball skills or something else? I think you’re probably right. He went from several days of playing 5 on 5 in training camp to four preseason games and now the real season. That’s a steep ramp for someone who’s been away from full-contact NBA basketball a full season. nobody is asking for him to be a starter but at least give the guy at least 15 mins consistently and let him get used to the pace. you can monitor him and allow him a chance to play too right? Agreed, Clifford never loved Lin. He did love Walker and Batum. Lin’s treatment in NBA plus the recent Harvard discrimination law suit really make me upset about Asians status in the US. We are like doormats being stepped over and over and over by all races. I’d like to see Lin get longer stints. But I honestly look at Lin and think he’s rusty, he physically was getting pushed around in some games, let’s ease him in at this higher level of intensity. And when Lin plays and doesn’t has game considerations if Lin is positioned right on defense or if his playing group overall looks organized or not. So, the head coach puts some other factors into consideration. Is it painful for Lin? We have to listen to Lin’s words. Lin says he’ll be up some games and down in others. He’s grateful to be back. I think he has a lot that’s weighing on him. But, unlike last season, he has a next game where he gets to play to see where his physical and mental game is. maybe he just like Lin but in a hierarchy of players to be played, Lin is less of his priority last time..
Lin played well for the minutes he was given (sigh), but helped on D and spacing for the 2nd quarter run before half. Again, a difference maker. Trae was hitting his shots and 3’s. Lin still needs to tighten up his handles again, but otherwise he looked a little quicker to be honest. Wasn’t needed for this game (bench role) as Trae was on a streak with Cleveland’s poor defense. If Lin was in the same position, we would be praising Lin, so great game for Trae. Hope Lin starts hitting his shots and get a little more aggressive, but he’s playing team ball and not forcing anything too much because it’s not his role. As he gets more confident in his recovery and trusts his body more, it looks like he still has plenty in the tank. More like Lin’s defense are also given bias ticky-tac fouls so he can’t guard other stars as closely. But Lin’s personal fouls has improve as he’s learned to not over help his teammates on defense anymore. That’s cause most Asian only cares about making money and living a good life. They don’t have any political awareness besides the big presidential elections. Does Lin’s dribbling look off? When he has a fast break, his dribbles look like he’s pounding it straight up and down and not low and out and in front. It’s like the height of the ball is at his chest. Doesn’t look right. Nash/Fortius dribbling and posture? have decided to only watch Lin’s highlights until he’s actually getting 20+ mins again. No clue why his minutes are so low either way it doesn’t matter, Hawks have their own agenda of propping up Trae and possible tanking. Most likely they got Lin just so they could have more cap space next season on an expired contract. At this rate I won’t be surprised if Lin gets traded mid season. Given that adcoms are largely White, I tend to think it’s a majority thing. Trae has a great game. Good for him. Vince Carter didn’t score much too. Has didn’t do that well last game and he does extremely well this game. Lin just has to play well with his teammates with his minutes. He doesn’t have to think much. It is a long season. He will get used to this new team. yeah….i do observe the same…not sure the reason, maybe he is protecting his knee, crossing do have impact on knee movement. I think one of the keep changes in bball is that, at pro level there is no need to dribble low. Don’t think too much. Let Lin play it out. Whatever will be will be but Lin must be able to deliver on the court. when is the earliest he can get traded? I went to bed after the third quarter so it’s not my fault. Politically, there’s not a lot in common with the Asian groups other than lack of political awareness or just apathy. I think Lin should, above all else, play at the weight that minimizes extra stress on his knees and body and maximizes his NBA career, but at the lighter weight I think he is playing at now his feet are slipping out from underneath him now and then, just like early on with Warriors / Rockets when we all joked that it was because he had just switched from Nike to Adidas sneakers! (the issue eventually went away at more muscular weight, and he couldn’t so easily get knocked off stride like defenders are doing now again). His dribble also has not been an issue since summer before joining Hornets (worked with Micah Lancaster and The Professor to tighten up his dribble so much), but ball still can get jarred loose when refs allow defenders to push and shove Lin so much like they have so far. me-Lo’s dribble is, when he is not trying to get defender flat footed so he can create separation for his jump shot, is actually much looser than Lin’s, and defense can cause him to cough up the ball alot more when they start to trap him. 3 games in 5 nights and Lin had minutes every game. A lot of teams would have sat Lin on Sunday. Maybe Lin should have sat Sunday. But he got out there and tried, especially in his last stint. If he didn’t play like many of us would have wanted, doesn’t matter. He played. It seems some fans have forgotten the reality of Lin and want him to somehow magically play like he didn’t have the psychology of the 47 missed games in his first season as a Net and the devastating injury of getting the patellar tear the next season and missing the whole season. Or that Lin was just cleared to play 5 on 5 basketball a few weeks ago. Put those facts aside. Lin should play more minutes. But why? What is the priority here? So the horrible coach is putting Lin down. I understand the PTSD but it is totally unfair to draw conclusions about the rookie coach now. We have no idea what Chelsea Lane has said to the coaching staff regarding Lin, or if she’s monitoring him, or what input Fortius or other trainers may have given to the staff of how to handle Lin. So why think so negatively already? The Lin out there is a human being coming back from a major injury. Beverley starts. And guess what? That’s a terrible idea. I’m glad Lin plays for a team that is sensible enough not to try to stretch him before he is ready. It is a terrible idea that Beverley starts due to his major injury. Nothing to do with his basketball talent. But his injury. And LIn should not start on the Magic or anywhere else. He should not start until he’s ready. And he’s not close to ready. Finally, the preseason was not the regular season. It’s like going from a 20 mph speed limited local road to the autobahn highway. You need much more concentration and physicality to play at this level. So we’re best to throw out the preseason, look at the now of how many games Lin played in a short time and be thankful and grateful for every game he’s playing. If one were to google and research patellar tears and players careers after them, it’s not pretty. If Lin returns and can play at any level in any role, he’s already beat the odds. Bad idea due to his injury. Lin said himself. It is a process. Some nights he has it, some won”t. Maybe he is on minutes restrictions. Maybe LP has his agenda. But as you said, at least Lin played for real NBA games 3 games in 5 night, since when? It is what it is. All we can hope is Lin stays healthy and gets ready by trade deadline. If Hawks doesn’t see Lin eye to eye, they will trade Lin by then with expiring contract. And hopefully Lin can find a team that can use him heavily. I think he’s in the right place right now. Dominique Wilkins had a patellar injury and after went on to perform at a high level. I think Lin should talk to Dominique about the healing and rehab process to help Lin along. Maybe where Lin is right now is a blessing. It wouldn’t surprise me if Chelsea Lane have Lin on strict minutes restrictions. What you said about 3 games in 5 nights makes sense. Lin probably shouldn’t have even played. The few minutes he played may have forced the coach to sit him down. As we’ve noted, Lin was more physical and moving better…maybe too much better to the point that they didn’t want him to exerting that much energy. Pros all tend to believe they are bulletproof. Even I’ve over did it when I was younger exerting too much energy while recovering only to suffer further setbacks. I’m actually in agreement with you that it’s a very good sign that they are keeping such a tight reign on his comeback. In fact, it means that they care about Lin’s health more than even us. Lol. Very well stated and reasonable expectations. “3 games in 5 nights and Lin had minutes every game” after missing playing basketball for a whole year and was only cleared to play 5 on 5 days before the preseason. I understand some fans have fear that JLin won’t be able to return to his level of play before but we should not let that fear lead us to unrealistic expectations and paralyze us. Noone knows when Lin’s body will get better. We can only wait and listen to JLin’s words himself of how his body is responding. Personally, I’m waiting to see the progress after the first 30 games but I’m open to see if this rehab will take half or even a full season. Regardless, faithful Lin fans will continue to cheer and support him. As fans, we are only along for the journey and can only send wishes, prayers, good thoughts to him. I know it can be frustrating but I have no doubt this comeback attempt means more to JLin than any of us. He’s the one spending countless hours lifting weights, hoisting hundreds of shots, and trying to make himself be productive like his old self. As he said in the recent podcast, fans will never fully understand the amount of time and sacrifice the professional athlete has done to achieve their accomplishment. I would implore Lin fans to give him what he needs, which is our full support no matter what happens. What he has done already made a worldwide impact and inspired a lot of us to be here. The greatest thing he has done is to give us HOPE that we should never give up in our own lives. Let’s focus on the good things and not let fear paralyze us. It’s not good even for our personal lives. Lin already played 3 more games than he has played last season and he continues to inspire us to give his best shot no matter what the circumstances might be. The results could be Linsanity II, his retirement, future coaching, NBA China VP, Dota eSports Millionaires, etc. The results don’t really matter at this moment. It’s about the PROCESS of what he does to continually improve every day. That’s my takeaway and Linspiration from JLin’s journey. We should choose to be inspired and not let fear get the best of us. “What he has done already made a worldwide impact and inspired a lot of us to be here. The greatest thing he has done is to give us HOPE that we should never give up in our own lives. There are various circumstances in Lin’s profession he can not control, from trade to rotation, no matter how his diehard fans wish he could. In his NBA career for eight years, Lin has overcome insurmountable adversity to reach the pinnacle and leap out of slumps. I hope that Lin will continue doing so with his trademark diligence, perseverance and determination. Wherever Lin takes his basketball talent, this fan will always support him. For me, he is more than an athlete, an Asian American role model, he is an inspiration to everyone. you guys nuts.. he gets traded and he won’t even play. Think about that. I’m afraid if he gets traded, you won’t be here at all because that’s the end of his nba career because he won’t get any minutes. So better for him to stay put. I don’t get yall’s logic.. you don’t eveerytime he gets to a new team he will be better? NO NO NO. think again and look at history.. when was the last time he gets to a new team and does better.. NONE except for hornet because that lakers was the bottom of the barrel. but you can’t for religion unless you say it yourself like how lin doesn all the time.. god. this god that. My eyes get welle up with tears while reading your beautiful, heart warming post! Thank you Psalm as always for your continuing support for Jeremy lin and us fans. Next one will go in. At least he started shooting 3 again. It is not even the end of October. Let’s throw all those theories out of the window and watch Lin play it out. Lin has to get used to the tight NBA schedule and he was tentative with new teammates. Rehab takes time. At least what happens to Jeremy is mental more than physical. He will get his confidence back after sinking a few good shots. I just treat this situation like an extended preseason. Now Lin will learn humility. His time will come. His strength will come back. He just has to get used to the team and new body playing at NBA level. The good news is he is healthy. Give him two months to come back; not two weeks. That his teammate plays well doesn’t mean Lin is changing anyhing. Let things take their course. Eventually they will work out. Some of his teammates hasn’t even played a single game. What do they feel? Lin is fine just take more than a few games to come back like he used to be. He needs to develop his confidence game by game. This team with Chelsea Lane will look at players like human. No need to be pushy simply because Trae Young plays well. Yes, Psalm has always articulated beautifully in his support for Lin. I was excited by Lin, the player. I was inspired by Lin, the person. Players don’t come back the same. Lin will have to redefine his game most likely. For him to come back and playing itself is huge! might be for the better. he should have redefined his game like 3 years ago. lets hope he becomes more of a inbetween player mixing more midrange and 3s with some layups. Shut your big white cuunt. Man, I missed this Lin.. the aggressive, shoot first Jeremy Lin.. Him shoot first mentally will automatically get his assist numbers up because that’s how he plays.. if you noticed. I mean he doesn’t get 10 and 10.. he gets 20 and 8 because once he shoots, defenders clobber over him and opens up others. The way he plays now is too passive (reminds of the rockets when he seems to be lost when looking for an outlet.. which should be just shoot). I mean I understand he is coming back from surgery and maybe Chelesa is telling him to just take it easy. But still not sure when he will come back like this.. This injury can be career ending so maybe he is taking it easy for now. I have thoughts on what Lin is doing now. And I think preseason was a preview of how Lin could play going forward. But now, I think he’s trying to prove he can still drive and get his speed/explosion up that way. I hope he doesn’t hurt his progress doing so. His midrange and short pull-up jumpers were working well during preseason. His shot is falling and then he just got into a beautiful flow. Notice, a lot of his points were on 3-point shots and mid-range jumpers. Only a few were at the rim drives. I remember this game well. Lin was struggling with his shot in previous games and it all came together in this game. Such excitement in the crowd when Lin gets it going. Seems different than most players. Here are some good long article on the injury and past player’s recovery. I very much agree that it’s likely Chelsea Lane has him on a very measured ramp-up. While everyone was nattering on about how his low minutes show he’s just a trade chip, a disposable mentor, past his prime, etc etc etc…I was quietly putting my money on a very calculated and careful re-entry. Even if (cynical worst case) he’s only valued as a cap-space piece, he’s got to be in great shape to get max value…so… As a dancer who’s had to come back from a few nasty injuries, and with many athlete friends in the same spot, my experience is no matter how much you know and how willing you think you are to really take the slow time to THOROUGHLY heal and re-condition, you start to dip your toe in again and the enthusiasm and pleasure very quickly overrides caution and you find yourself set back 10 paces again. You need folks to be expert enough and who care enough about you to pull you back. I’m good with the minutes for now. Still too early to say “the sky is falling”, imho. Also, from a completely different angle – for Chelsea Lane as a top performance therapist, Jeremy Lin has GOT to be catnip. Here’s a very committed subject with a very interesting physical challenge on whom she can really exercise all her expertise. She will have him in full focus. Thanks for that great old Mercury News article about Lin’s early training. There’s no way no how Lin is a garbage time player. The fact that he even played in the garbage time serves a purpose and that’s to get him into game shape. The hardest part about coming back from a knee injury is the defensive end where he has to react to the moves of others. The offensive end is easy, he could plan his moves. That’s the reason why he’s even playing in the garbage time because it’s not as intensive. It’s the best way to get his knee ready and to improve his multi-directional movements. I expect his minutes to increase. Trust me. Looking forward to see what he would do this Wed.
it only worked well against 3rd stringers and G-league guys. not so much against actual NBA players. I am glad Lin is in Atlanta. This team will try their best to help Lin be productive on the court. This team had much better trainers than those in the Nets. It would make sense if you define the totality of basketball as a leg, which is probably not correct, but I am confused. That’s absolutely true about Chelsea Lane really hyped about working with Lin and his positive attitude and dedication. I can’t totally understand that. When I used to coach a top player with issues, I’m exactly like that. When medical professionals say it’s their practice, they literally mean practice. That’s because every single person is different. As a coach, there’s no better “practice” than working with a great athlete. They can learn so much faster than anyone else so you get to practice your ideas on them. My experience with a college tennis player and a top club player taught me that their learning curve is miles apart. Typically, the college player will learn something in 1/10th of the time. My lessons were more about the challenges to my teaching abilities than about the “patient”. He taught me how to be a better teacher because I was able to practice my ideas and learn what will work and what would not. His ability to learn fast means I could see within 1/2 an hour if my ideas were good or bad. Meanwhile, the top club player would take months to learn something instead of less than an hour. Having Lin as a patient can be just as rewarding for Chelsea Lane. odd whats going on with lins shot though. im guessing he is not jumping high enough. Thanks for posting these links. The reddit summary was comprehensive in describing the specifics of Jeremy’s situation. I’m very encouraged by what I learned. I’m sure this video (from the reddit link) has been posted here multiple times since it was released in January 2018, but I was especially impressed by Jeremy’s comments on his longterm goals for his recovery. He’s not just thinking about this season, rather on being able to play at even higher levels well into his mid-30s. It’s a great reminder to those of us who get easily discouraged by the lack of minutes or stats these first 3 games. Jeremy’s timeframe for his recovery is much, much longer than the beginning of this one season. Hawks news: Dedmon set to return in Wednesday’s game vs Mavs. More Hawks news: Collins NOT ready yet. This is projected to be about a month out from inflammation/sore ankle, under the care of Chelsea Lane, who has tons of experience with ankle injuries. Collins is supposed to be part of their future. Being careful. Any wonder the Hawks are being extra careful with Lin, older, and coming back from major injury? 3 separate vids of JLIN WORKING OUT with the Coaches. Just Lin with coaches, including Lloyd Pierce. They were not necessarily looking to get the ball to Lin. LP being selfish? 🙂 So, what is the goal? Maybe just to get extra conditioning in for Lin. That’s not a bad thing. Pierce is playing PG, Lin is playing SG. Lin gets an assist. Pierce looks pretty fast running the floor. Gee, and we were getting along so well….lol. You just made my point. Baron Davis came back, Woodson coaching. Lin forced to adjust and defer. To me, “combo guard” is a put-down. Implying not good enough to lead in either position. Yes, Lin can play either position. He’s just much better with ball in this hands to start the offense. Don’t bother replying. We won’t agree on this. LP is only a year older than Vince Carter. How about that? @psalm234:disqus, please release my post. Problem could be talking about Rudy. Also edited two 3-letter words. Thanks in advance. Had no idea that Lin would go to Hornets. Or that Atkinson would get a HC job, and get Lin to sign with the Nets. Until Lin writes a memoir, we will never know what’s really behind the scenes. Lin will manage his own career and do what’s best for him. Ok, got it. THANKS FOR TAKING THE TIME! BETTER VID from Fox sports. JLIN makes shots! LP with 2 assists! And Lin made a contested 3 while testing the new arena. Good sign? Not sure when in the game, but looks like he wants to get a first-hand look at Lin playing SG. So, to me, it’s interesting that only Lin was playing with the coaches. I wonder if it was to get Lin more comfortable. And LP was playing along with him, at PG no less. Maybe this is a feature and sometimes coaches will play with a rotational player or another player. Or maybe this was just something for Lin. Hard to tell. Wow. So he is quite young as a coach then. Dominique Wilkins, 1997, Spurs. Missed 8 games. But yes, the Achilles tendon was Dominiques most serious major injury. I think the amount of devastation one feels, especially at that time, after that type of injury is pretty similar to the patellar tendon rupture. There aren’t that many in basketball. I’m encouraged by some of the recoveries of this injury in football. Not all, but some. I wish a reporter would interview Chelsea Lane to inquire about the Return-To-Play protocol for Lin and her estimated timeframe for recovery. Also, what her professional opinion is about Lin’s injury and recovery, especially when compared to Steph Curry’s career threatening ankle injury that she successfully treated in Golden State Warriors. I think it’s weird he is playing with the coaches. What, they can’t evaluate Lin playing as SG during practice? So now Lin is delegated to playing BB with Chinese players and coaches? That doesn’t look good to me. We’ll see, always hoping for the best for Lin, but this is not good in my opinion. Possibly, it’s just to get Lin more conditioning and reps to play the system while testing the new court. But it is interesting that only Lin was playing with the coaches. Why not include one or more players? We are concerned with Lin not contributing much in the last game but perhaps the Hawks is also concerned that their $13.5M investment might drop in trade value? It’s too early to tell at this point. You also said after each Lin injury that they were “a blessing in disguise” as they allowed the younger Nets players a chance to develop and provide Lin with a stronger team once he returned to action. How’d that work out? I hate to tell you this @Dorothy but of all the mistreatment Lin endured in the NBA, do you realize who abused him the most? Why it’s none other than Joseph Tsai who is not only Asian, but specifically Taiwanese and a Christian Ivy Leaguer. In what universe does a multi-billionaire buy an NBA team that happens to include his all-time favorite basketball player and within months that same player is dumped to the worst team in the league for nothing in return? Lin was under contract and was attempting to come back from a horrific injury. Tsai didn’t have enough wealth to make sure Lin was treated with an ounce of respect? Did the Celtics dump Gordon Hayward? Tsai is the worst villain Lin has encountered in the NBA. He is despicable and makes Asians look bad. Don’t we wish. As a general rule, I don’t recall any trainers or medical staff ever being interviewed. Guess they leave it up to PR to handle. BIG CAVEAT: Not based on fact. This is just my imagination running wild. Don’t get upset with me. What I propose would have no bearing on the real world. Correct me if I’m wrong. NBA teams are only allowed to dress 13 active players to play in a game. In Game 3, there were 13 dressed, including Adams. Now, Dedmon is coming back. Yet, per Kevin Chouinard, the Hawks are still bringing Jaylen Adams (2-way) for the opener at home. Does someone need to be made inactive to make room for Dedmon? Unless they carry Adams, but make him inactive? ASSUMING HAWKS ARE STILL SUPPORTING LIN AND HIS PLACE ON THE ROSTER. I don’t know how this really works. But how would you guys feel if Lin did his rehab in the G-League? He would get more playing time to get back in sync, without all the pressure to immediately perform at top-level, and risk re-injury. Here is list of players, including STARS AND STARTERS, who did rehab with the G-League. Again, I would be okay with this idea IF, ONLY IF, the Hawks still value Lin and will bring him back once he’s back to form. MY BIGGEST WISH IS FOR LIN TO STAY HEALTHY. AND TO BE ABLE TO PLAY. So, this scenario WOULD NOT BE IDEAL. But, if Lin is not 100% ready, and the Hawks want him to take it slow with his minutes. Is this an acceptable alternative for the short term? Or, no, it’s a bad idea? OT: RHJ just became a father. Congrats to him. We’ll take the friendly bounce – haha! Loco Moco with Spam is delicious! Try it! I think your original intent made more sense. To compare the two most severe injuries. Oh, yeah, i knew it very well. Didn’t you see some Harvard Chinese students came out testifying FOR Harvard. There are always traitors among the group. As always, JLin being kind to fans, especially the kids. ASSUMING HIS HEALTH IS STILL BEING MONITORED. So, you think it would be preferable for him to play with the Hawks, even if less minutes? It seems like other teams have used G-League to help. If Lin gets more minutes with G-League, maybe he could be back in shape sooner? But you’re right, the competition is not the same. I’m guessing that Jeremy was probably the last player at the facility and just said “sure thing” when the coach asked him to join in a friendly pick-up game. I wouldn’t read too much into this. I very much doubt there’s any training value, just chilling with the coaches. It’d be a mental letdown to be sent to the minors; definitely a bad idea at this stage in his recovery. It might’ve been fine several weeks ago when he was just starting 5-on-5, but not now. What it boils down to is the trust of Atlanta to do it’s best for Jeremy to help him back. With no evidence otherwise, I tend to trust that the team is doing its best for Jeremy. I believe the interest of Lin and the Hawks are aligned so that Lin will be best taken care of. We can tell after one or two months. I think this might work for rookies, but not the veterans. Lin knows the game good enough, and he’s relearning his body and reshaping his play to the highest competition form because he is healthy right now. Also I think he might have more risk to play with more ruthless young rookies who are desperately proving themselves for their worth in the league. What you said, they know more than us, applies to Jlin too. For all we know his playing times are in total agreement with Jlin and maybe his idea. I am sure he is telling the team how he is feeling because only he knows for sure the true state of his health. ATL is in a way a good spot for Jlin because there is no pressure to play (or for the team to win now) other than for him to get better and play for his next contract. In BKLN there is more pressure to win plus he would be fighting for PT with Russel and Dinwiddie. He is still playing so there is no need for gametime to test his readiness. 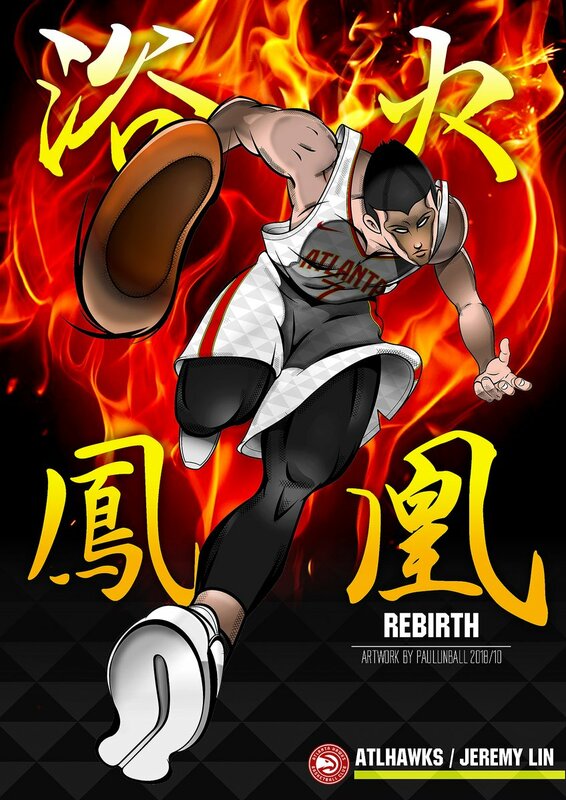 ATL may be just setting themselves up to make a move after mid-season when they have had time to play as a team and for Jlin to get game fit. There are still 39 games left until the halfway point so plenty of opportunity to break back in. I think after 20 games ATL and Jlin will have a good idea of where they stand. Spam is loved all over the world because of the Second World War when food especially protein was so rare. It’s a Specially prepared army meat that help win the war and it’s widely used for famine and disaster relief. Wikipedia has a great write up on its history and surprisingly, there’s even specialty flavours that’s only available in Hawaii. I like everyone else got indoctrinated when we were young in China and Hong Kong to loved it as a treat. Even today, I get a craving for some fried spam with eggs. IMO, Lin doesn’t need too much court time as yet. I’m almost certain he’s on a very restricted PT. Reduced game play is a way to get hi used to it. Thanks for response. It was a thought, how to get more playing time for Lin. Agree that at the moment, Lin and Hawks have mutual interest in making sure that Lin stays healthy. Also agree we will see how it develops in the next few months. Not sure about the word “trust” though. IMO, that’s too strong a word to apply to ANY front office in the NBA. Was bouncing idea of how to get extra time for Lin, without extra pressure. But, as always, his health is first priority. Thanks for your thoughts. G-League season starts Nov 2, so they couldn’t do it sooner. Thought it might NOT be considered a demotion because of precedent by other Stars/Starters. But, point well taken. Thanks for response. Yeah, it would sure cut out a lot of the speculations.